If you want 3x and 65 degrees apparent, this is easily done without prisms, but with an image rotated 180 degrees. Goes deeper, but not as fun being upside down. Then there is the Amici prism that aims at the zenith easily, but they cost $40 each for coated ones (Agena sells uncoated), and the clear aperture is only 18-19mm. You could buy an Abbe-Konig prism, but they are expensive, likely small, and hard to mount. Alas, the Nikon 2x may be the best we can do for now. 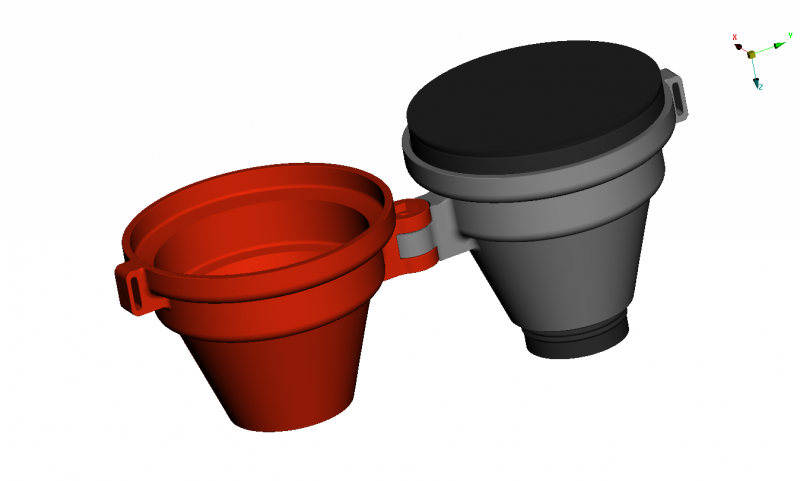 Oh, you can also mount a relay lens and use an Ethos eyepiece, for an upright image and ultrawide view. But then you are talking big. The Galilean system has less field curvature than the Keplerian. 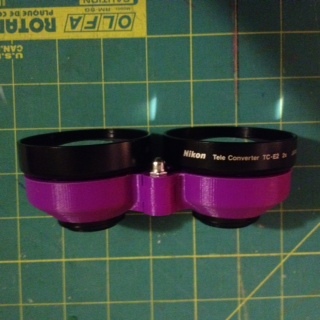 If $30 per teleconverter is expensive, look at the cost of an eyepiece for a Keplerian. This is still the cheapest way, it seems. Edited by stargazer193857, 03 October 2016 - 07:12 PM. Learned you can look at solar eclipse between diamond ring/bailey beads to bailey beads/diamond ring with up to 3x binos. The experts at Great Lake Star Gaze said no filters required up to 3x during solar eclipse between bailey's beads (including diamond ring). Man, i'd never tell anyone they could look at the sun with any kind of unfiltered optic, I don't care what stage it's in. Just on general principle of the issue. What happens when some kid continues to watch as it comes out of totality ? That is nuts IMHO. Sounds like "solar roulette" to me. No one goes blind as long as they stay lucky. When I was a kid I used to look at the sun when it rose above the horizon, though it'd help my eyesight! My friend made a scan of the Nikon 3X-TC, and then pulled in the 2x central pivot, and tie strap CAD from before. Wish I could paste an image from my thumb drive (but don't know how with URL). He didn't know how to factor in shrink rate so he made it a perfect skin tight fit. I'll try to make them in stereolith and put them together (may require sanding). When replying, click on "more reply options". Then you'll be taken to a page where there's an option to "Attach Files". Click choose file, select the image on your thumb drive, then click "Attach This File" to attach it to your reply. Edited by Cometeer, 08 October 2016 - 02:56 PM. I have asked ny friend to delete the third tier to accomodate smaller IPD without having to cut/file the inside outer ring, and to move the bino strap loop to the second tier. Print it with ABS or PET-G and 150 layer height and it should work just fine. In case of those materials you can sand the shells inside if they will print bit too small and get nice fit. Nylon is more expensive and harder to print. They agreed to print it for $15 PET-G 150 purple but I have to pick it up, they don't ship. Ready in 5 days. Supplier said PET-G was more durable strong and won't crack, compared to ABS. 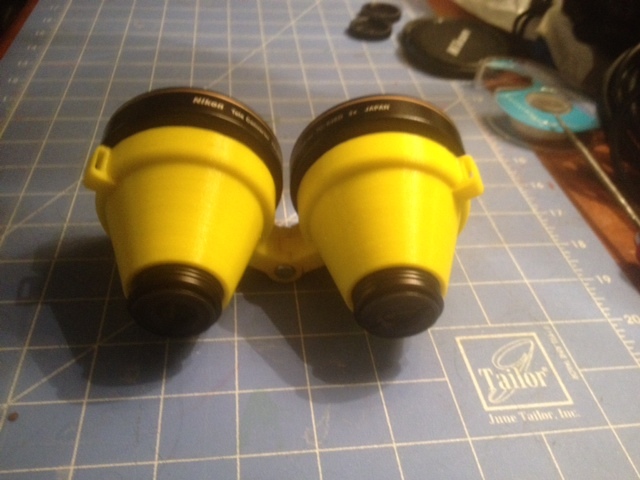 This is same supplier that would not print in nylon for $24 since part was "too detailed" for his printer. Picked them up and put them together. They work great with eyeglasses and the TFOV is slightly less than without glasses (but without glasses it is out of focus with my 0.75-1.0 astigmatism). Thank you for providing the CAD and where to print. 3D Hubs replied back and says new customers receive $10 off first order at http://3dhubs.refr.cc/CP6QM22 and I believe you get to pick the USA site close to you. One thing I recommend is moving the strap holders halfway between the top and side. 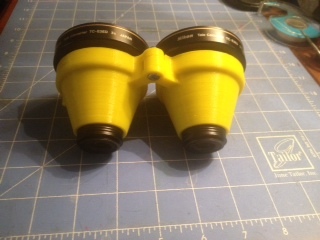 I find that for me (I have a small IPD), when the binoculars are folded, the strap holders are between the side the bottom. 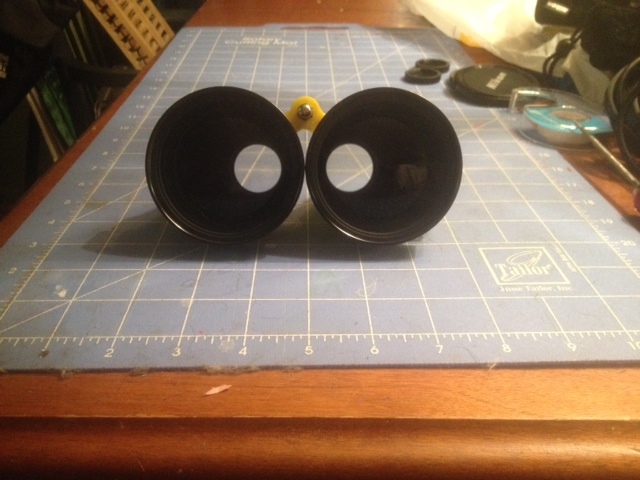 This causes the binoculars to flip over when worn. 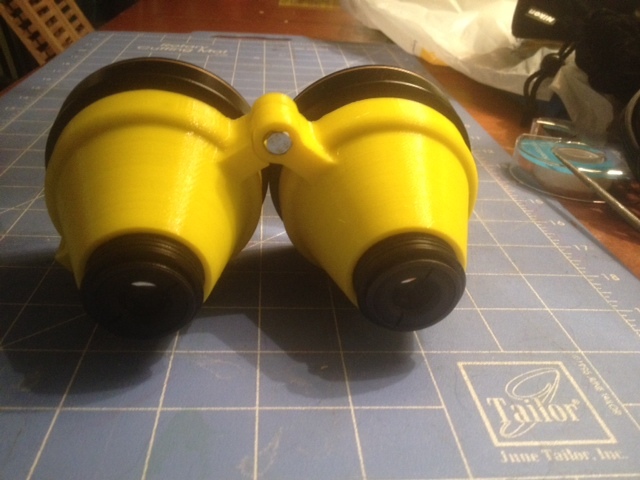 Moving its location would mean that for those with a small IPD, they strap holders would be at the side of the binoculars when folded. 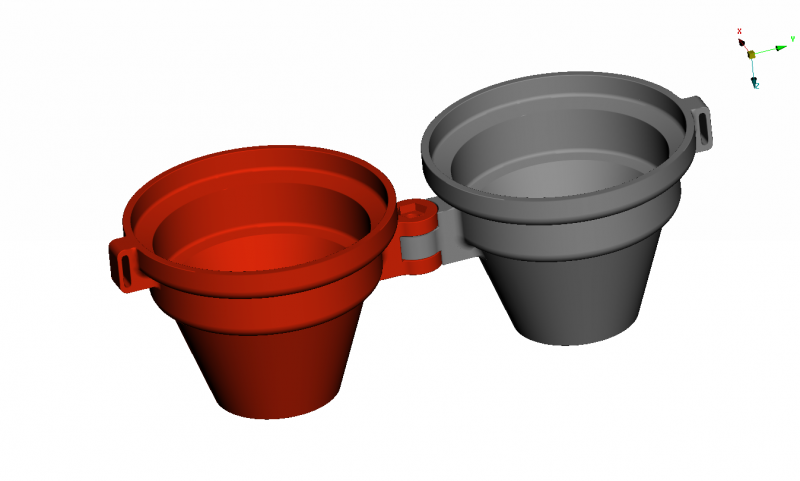 Have you a file which a 3d printer can process? Yes Post17 is the one for the 2x. If the 3x one works I will share. 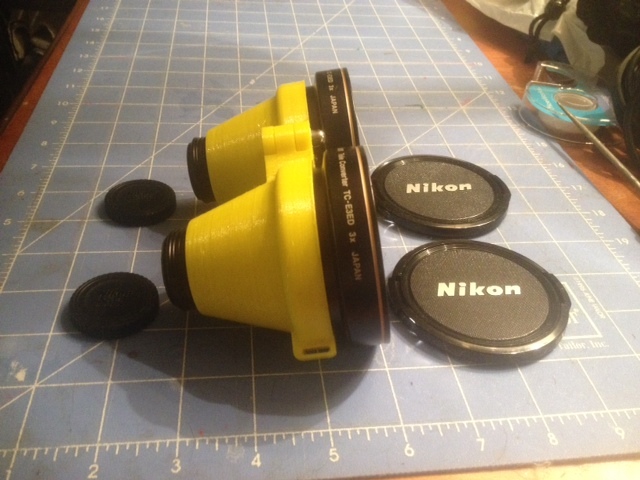 Just submitted my order for revised Nikon TC-3X stereolith bino holders for about $21 pickup PET-G 150 Yellow. Should be made by Oct 20th. If they work fit w/o issue I will share the STL CAD (assumed no shrink rate from the inside surface scan, so it may be tight and require some sanding). The next two messages are excel files are images of the CAD TC3X bino holders. Edited by faackanders2, 15 October 2016 - 10:46 AM. Someone here should jump on this one. I just finished assembling and they fit the Nikon TC-E3ED 3x teleconverters like a non-tight glove (I would have prefered a tighter snap like the 2x version). Double sticky tape preferred. 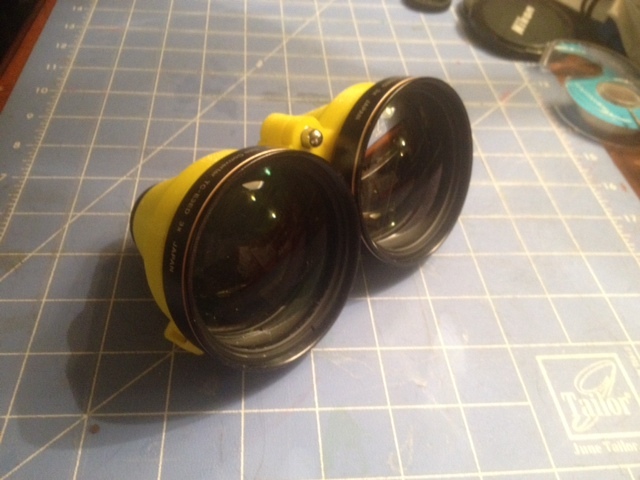 If you wear reading glasses you will need these (not your far distance glasses) since there is no focus. Unfortunately it is cloudy so I am not able to do any observing tonight (and I would have loved to see the Moon traverse the Hyades and occult Aldebarin yesterday). 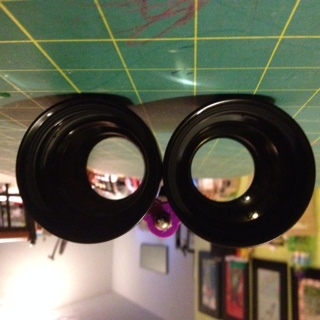 I will post images of the hand made 3x binos shortly. Any problems noted with that 3" IPD? Please can you provide to us the print file. My IPD barely fits the 2x54. This 3x bino sadly won't work for me. Some may have to file down the contact point of the black teleconverter outer ring to achieve smaller IPDs.